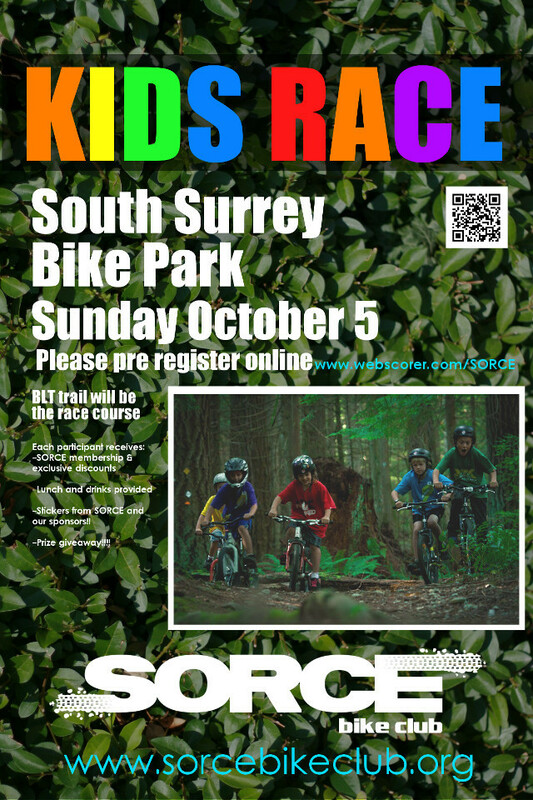 The 2014 SORCE kids race at South Surrey Bike Park has been rescheduled. It will take place on October 5 at 10am . The race course will be the on the BLT (beginner loop trail). please pre register online. Medals for all participants and food for all after the race! Hope to see you there! New lock box at Port Kells – it’s great! But no key yet. Push to sort out pump track at PK. Dirt delivered. New site? Under Hydro easement 102 + 140th – Talked to Hydro, grant for Not for profit…environment spin? Annual budget for maintenance for Invergarry? $5K – can we use it for 2014? Can we use the $5K for the plan? Ben ran last weekend. Kids all stoked. Only 3 people signed up. Oct 4 – Pumptrack race? Do we need to manage volume of work? Do we have the capacity? The next Toonie race is Sunday September 21 at the Delta Watershed. The race starts at 10am. On site registration opens at 9am. 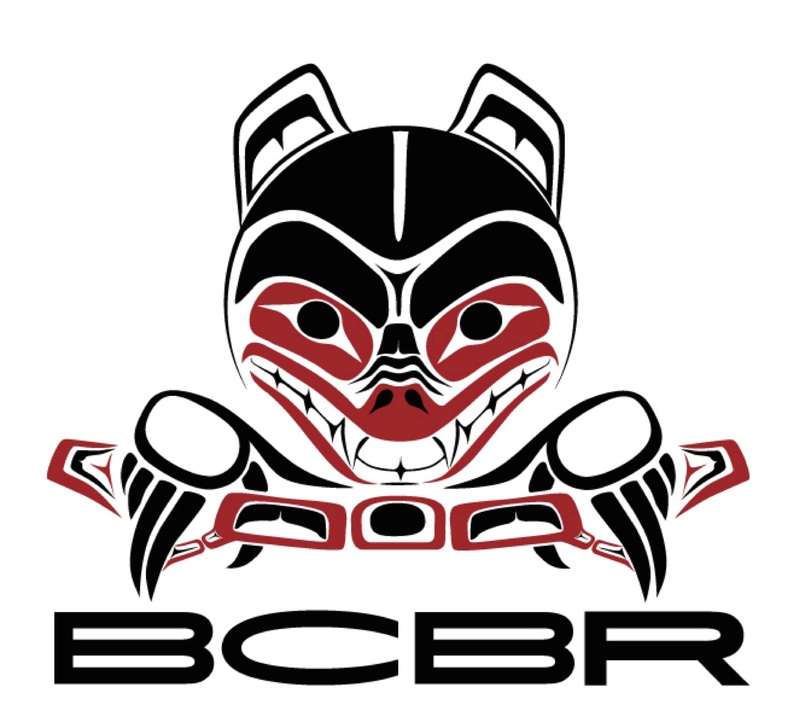 Once again we are sponsored by Red Racer Beer, brewed right here in Surrey at the Central City Brewing Company. 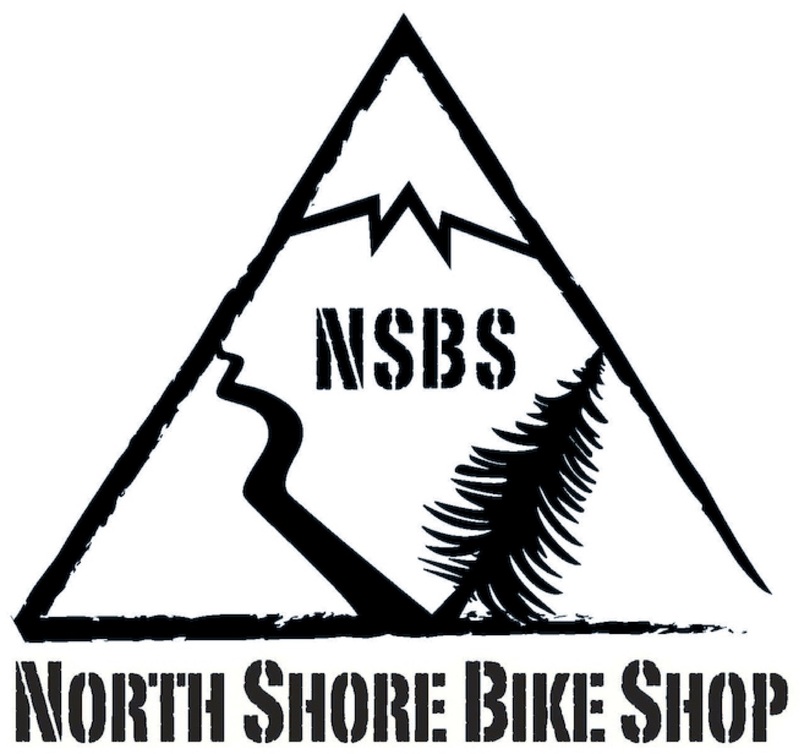 Velocity Cycles, The Bike Zone, Peninsula Cycles and Rocky Cycles are the 2014 shop sponsors. We will have great swag to give away from Norco bicycles. Lots of tasty beverages for the tired racers and volunteers and hot food after the races! We look forward to seeing you at the race. There will be a beginner intermediate and advance categories. So come enjoy this fun race for all skill levels and ages! Registration is now open for the next round of the Pump track race series. The next round is at Holly park September 7 at 10am. We look forward to seeing you there! 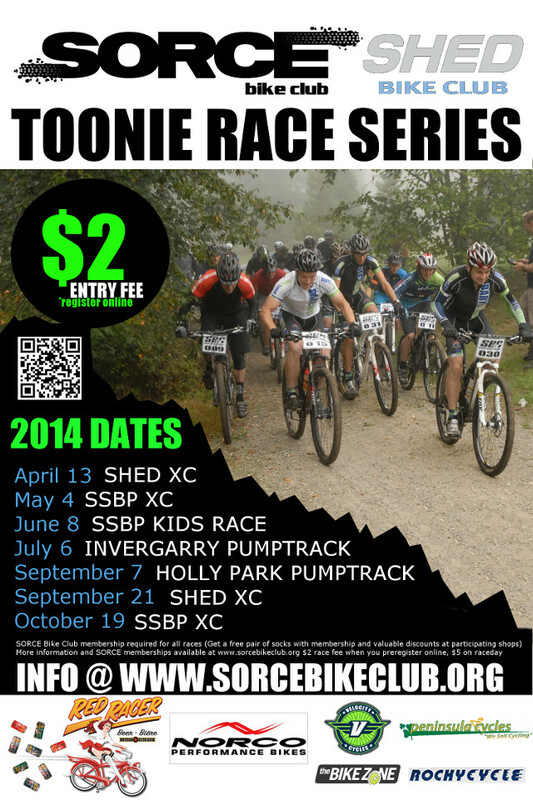 The SORCE/SHED bike club Toonie race series is back and better than ever for 2014! Once again we are sponsored by Red Racer Beer, brewed right here in Surrey at the Central City Brewing Company. Velocity Cycles, The Bike Zone, Peninsula Cycles and Rocky Cycles are the 2014 shop sponsors. We will have great swag to give away from Norco bicycles. Lots of tasty beverages for the tired racers and volunteers and hot food after the races! We look forward to seeing you at these events that are fantastic fun for all skill levels and ages! 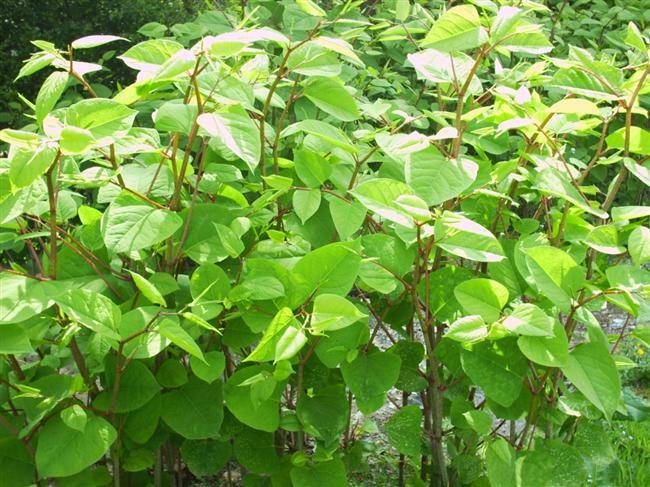 City of Surrey Parks department will be treating the invasive plant Knotweed on August 27th in and around the bike park at Invergarry Park. The Knotweed will be spot sprayed or injected with Roundup herbicide (glyphosate). Only the Knotweed will be treated. Notices will be posted at the entrances to the bike park, at the kiosk and throughout the bike park. Postings will go up on August 26th and will be removed on August 29th. Application of the herbicide will be weather dependant. If it is raining the treatment will need to be postponed. The herbicide applications will be done by a certified applicator and as per Provincial, Federal and City of Surrey policies and regulations. 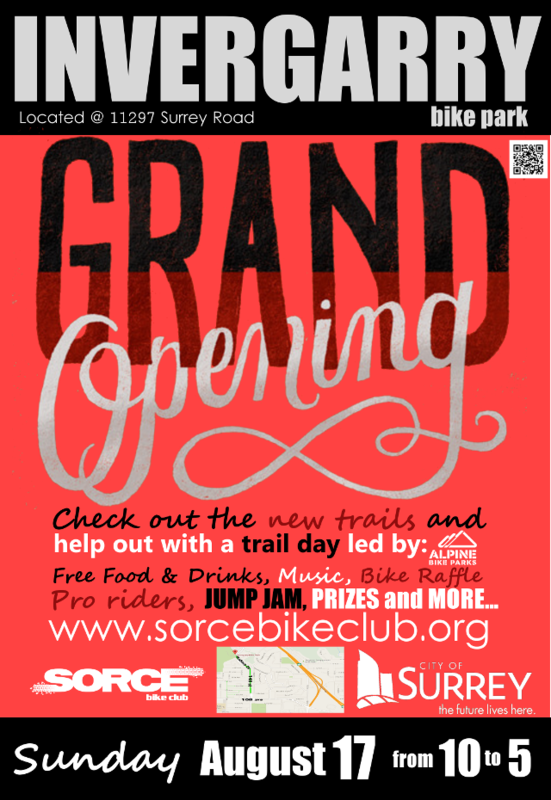 SORCE bike club and the City of Surrey are teaming up in a big way... The new trails built by Alpine Bike Parks are complete and we are having a party to celebrate! The festivities begin at 10am Sunday August 17 (we know its the last day of Crankworx but you should come to this instead!). Alpine Bike Parks will be hosting a dig day from 10am-12. We are going to add some new features to the green trail Little Shredder. There will be a Ribbon cutting ceremony @ Noon. Then its time for food and drinks followed by a jump jam. We have lots of great prizes to giveaway from our sponsors and a WeThePeople bmx to raffle off!!!! We hope to see you there. Keep your eyes on our facebook page for more info as it develops! 1. SORCE funds - motion carried to only use funds for activities consistent with the mission and vision. For example, funds will not be used for purposes of supporting charities or other not-for profit work. 5. Bike camps - review Oasis policy for insurance. Based upon premise that camp activities are covered as long as participants are SORCE members. Thus membership included with camp. Does the waiver specify SORCE and coaches? The SORCE pumptrack race series is back for 2014! 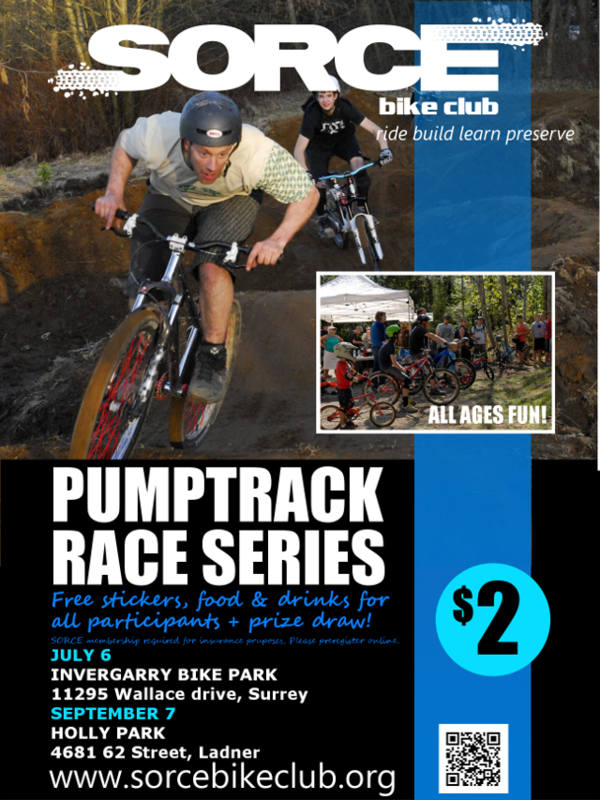 The first round is at the Invergarry pump track July 6. All ages and all skill levels welcome. Prize draw for racers. free food and drinks for all participants. $2 entry fee with 2104 SORCE membership. Please preregister online HERE SORCE jerseys and Tees wil be available on site. We will be giving away free stickers to everyone! The race starts at 10am. on site registation starts at 9am. 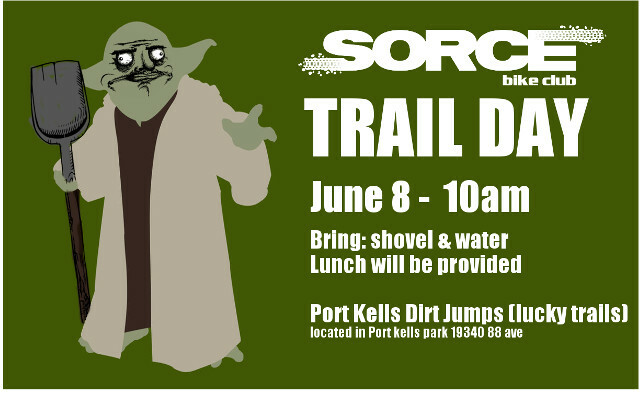 Round #2 is being held at SORCE/SHED's newest bike park Holly park in Ladner on September 7!